A late start today after the very early start yesterday. We slept on a level bed after loosening the mooring ropes. Not that it made much difference as both of us were very tired. Departing at 10.30am we cruised down to the water and elsan facilities above Littleborough and on the way were somewhat amused to pass a good mooring above Bent House Lock. If we had gone on an extra 10 minutes yesterday that would have been our mooring last night. The water pressure at the service area was rather low and we spent almost an hour filling both boats. Wandering around I noticed this unofficial sign post. Love the bottom sign. Australia is down-under! There is a large cooperative store at Littleborough with access from the moorings below Durn Lock. However we pressed on towards Rochdale. After Littleborough there was a long pound which was somewhat of a relief. 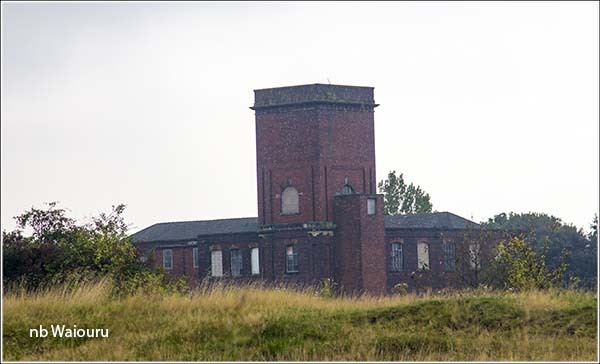 A large abandoned looking building on the outskirts of Rochadale had me wondering about it origins. On reaching the fringe of Rochdale we turned into ditch crawlers as the canal was very shallow and full of rubbish. Jan got off to open Moss Swing Bridge and then we got something around the prop when passing through. The loss of steerage resulted in us running aground. I poled us off the bottom and we limped down to the next bridge where Jan held Waiouru against the towpath whilst I dived down the weed hatch. There were a couple more locks to do before reaching the mid point of the canal’s route through Rochdale. I wish we had a 10p coin for every can and plastic bottle we saw in the canal. Jan had some assistance from two locals at Lock 50. Thomas (fine sounding name….. do you know it means strong and handsome?) 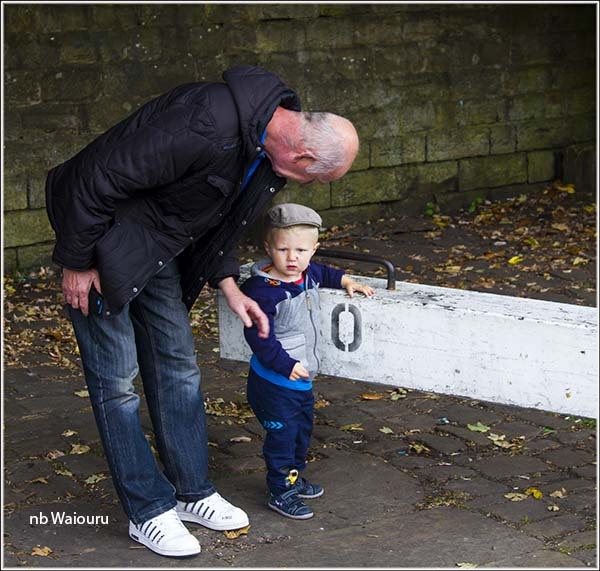 regularly visits the canal with his grandfather. 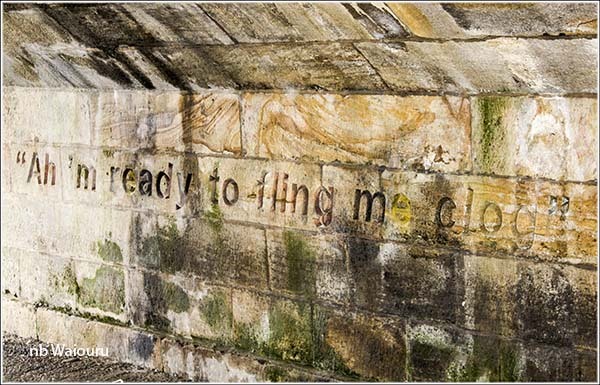 Some unusual graffiti on one of the bridge arches. I guess this means the old boaters wore wooden clogs. It was somewhat of a relief to leave Rochdale behind and get back into open countryside. The M62 motorway was built across the original route of the canal when it was abandoned. Consequentially, the canal had to be re-routed when restored. 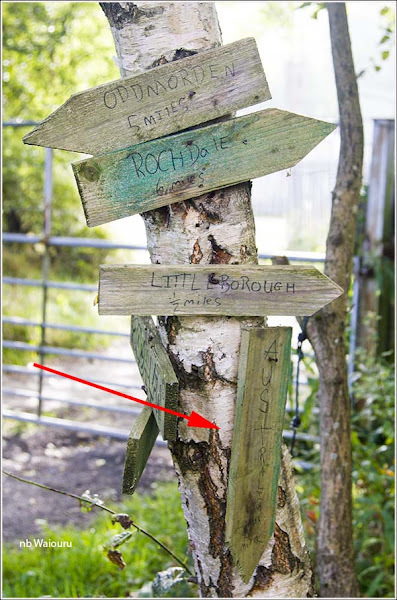 Apparently this was achieved by utilising one of the road culverts and repositioning a lock. 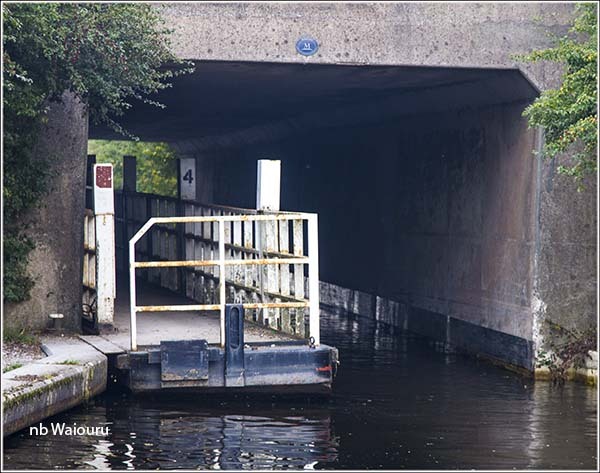 Whilst the road culvert is wide enough for a wide beam boat there’s insufficient room for a wide beam and a towpath. As there was no other route for the towpath a moveable floating towpath was installed. 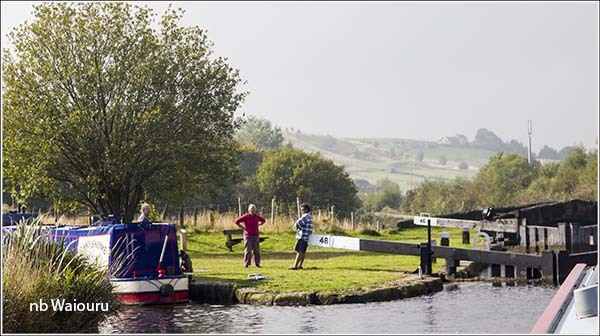 There is sufficient room for narrowboats to pass without having to move the pontoon. Just beyond the culvert is the relocated lock. It’s wide and deep with straight concrete sides and doors that seal well. Just like the old boaters would have wanted their locks to be. Looking back to the new lock it’s possible to see the former route of the canal to the left in the photo below. Leaving the noise of the motorway traffic behind we headed into quiet, open countryside free of rubbish. The day ended with good moorings at Slattocks. Both the dot and DTV are OK and the aluminium washing tree is out on the back covered in clean rags. There’s still a little light so some foraging in the hedgerows for yet more blackberries might be on the cards. Not seen that floating towpath before under the bridge, interesting and intriguing solution. Yes, I assume it was the only practical solution when the existing road culvert was used as part of the new canal alignment.